All Things Crafty: Bold Binding Option - Too Much?? 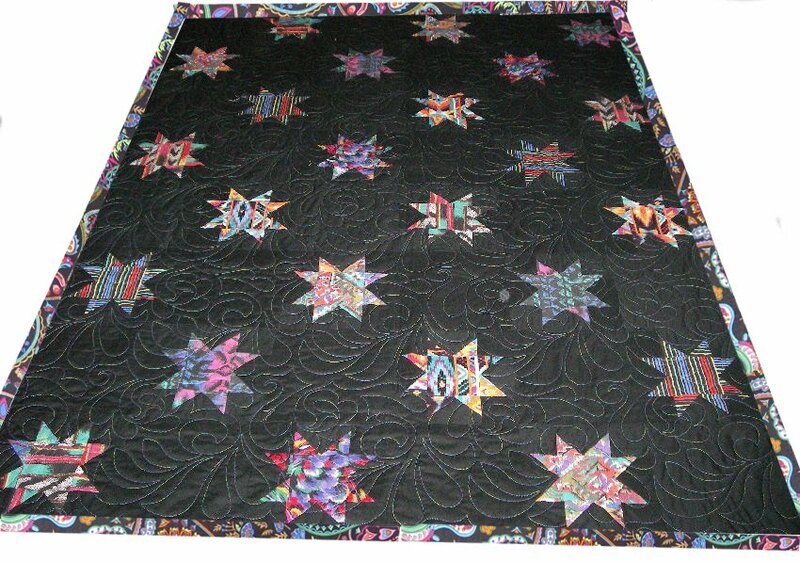 When I was browsing in Joanns (it's my closest fabric shop) I thought maybe I can find a black fabric with bright colors to go with my Western Stars shirt quilt. Oh did I ever find a brightly colored black fabric. It's so busy but, I really like it. I'm just not sure the modernness of the fabric goes with the western shirt fabric. The colors match nicely but I'm just not sure. I'd love to have your opinions. 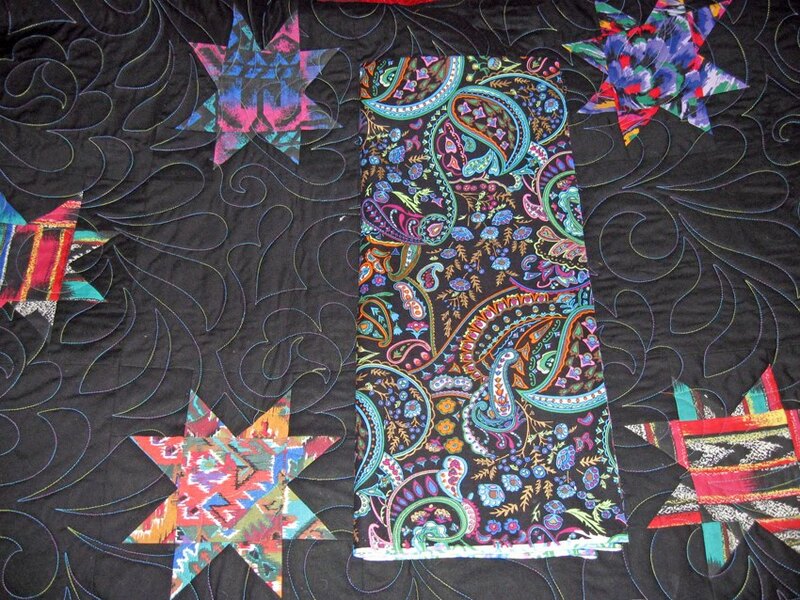 I was thinking of giving this quilt to a neighbor to for a fund raising event for Cancer. Cancer has touched the lives of so many close to me that I will do what I can to raise funds. I appreciate your input!! On the second photo below, I used a snippet of the fabric to mock what the binding would look like. If it were only that fast and easy :-) Click on the photos for better views. I think it looks great. And even in the 2nd picture, you're showing too much of the fabric. Even will be visible on the real binding. It adds a nice touch of color, is not as boring as a solid black would be, and compliments the stars, rather than competing or conflicting with the other fabrics. wow, you are quite computer literate! I'm not an expert when it comes to bindings, but "The cutting edge" on my blog roll noted this week that she uses a colour from one of her blocks to pick her bindings. I'm not that precise though. Is the back black also? Would a solid colour be more popping to say make the quilt colours stand out. It's always hard to pick the right colour on computer as the colours aren't like real life, but if you see say a blue or pink or whatever that you want to stand out, then look at that... I think the print you chose is too "busy" in that sense. 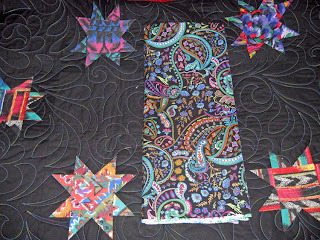 I really like the colored binding--it gives a real finish to the quilt and feels essential instead of an afterthought. The other choice would be to pick your favorite color from the stars and go with a matching solid, but anything but black will feel very bold. Bold is good, in this case. it's perfect... go with it... it will accent perfectly. I think it looks great. The paisleys in the binding fabric do have a western flare. I'm amazed you found such a perfect fabric! I really like the bolder binding. I think it will look great on the quilt. Great pick up. So pretty with the black background. Love the stars.